Moscow, a city enormously rich in history, art and culture, thrills visitors with its majestic beauty. When planning your Eastern Europe tour, this city deserves a place on your list; from historical sites, museums and squares, to amazing theaters and restaurants, this city’s architecture and lifestyle will not leave you impassive. Preparing and organizing your trip in advance is a must in order to see as many places as possible and create life long memories. 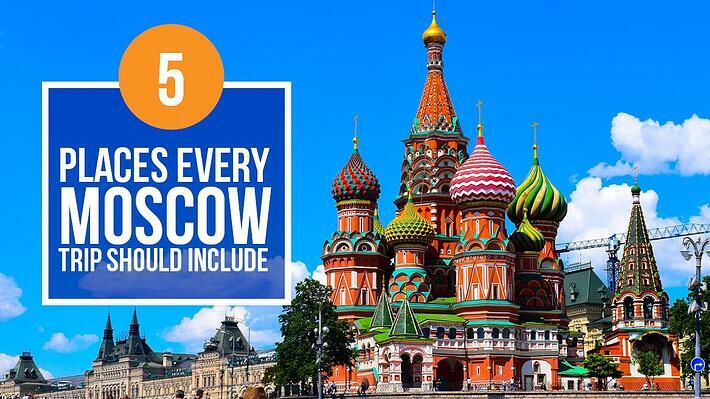 To warm up before your trip to Moscow, here is the list of top five places you should not miss. At the heart of Moscow, you will find Red Square, the founding site of the city. This vast rectangular stretch of cobblestones is surrounded by breathtaking architectural wonders. Throughout history, this square was a merchants’ area, a spot where high-profile executions took place and Soviet rulers chose it for their military parades. Nowadays, the traffic is closed and the place is buzzing with tourists, businessmen and bridal parties during the day. At night, the place becomes empty and gets back its true beauty; with St Basil’s domes and the Kremlin towers, it gives a tantalizing view. The only sculptured monument, a bronze statue of Kuzma Minin and Dmitry Pozharsky, who prevented the Polish invasion in 1612, is located on the square. The site is recognized as a UNESCO World Heritage site due to its inextricable connections to the country’s history. The icon of Russia, St Basil’s Cathedral, is located at the southern part of Red Square. Its amazing combination of patterns, colors and shapes represent unique Russian architecture. In 1552, Ivan Grozny, the first tsar of Russia, ordered its construction to honor his victory over the Tartar stronghold of Kazan. This cathedral consists of nine main chapels: four big, octagonal-towered chapels with four big domes, the tall, tent-roofed chapel in the center, and four smaller ones in between. The vivid colors of the cathedral were not there at the beginning. It is said that the original color was white and the domes were gold. The process of repainting started in the 17th century. After the Bolshevik Revolution, the cathedral was confiscated by the state and became a museum and tourist attraction since 1929. This historic fortified complex overlooks St Basil’s Cathedral, Red Square, the Moskva River and the Alexander Garden. Kremlin is most popular for its citadels (kremlins) and includes four cathedrals, four palaces, Kremlin wall and Kremlin towers. The place serves as the President of Russia’s official residence. Throughout history, this place has been the center of military aspirations, political intrigue, but mostly prominent for its magnificent cathedrals and churches. Kremlin’s territory occupies an area of 27 hectares and luckily, a larger part is accessible to tourists. Within this complex, tourists have difficulties deciding what to visit. A must see include: Kremlin churches in the cathedral square, Ivan the Great Bell Tower and the Assumption Belfry, Patriarch Palace, State Kremlin Palace (a concert hall) and Armoury Museum. These places are accessible with purchased tickets or arranged tours. Presidential and administrative buildings are off-limits to tourists. Moscow’s ultimate landmark, Lenin’s Mausoleum is a house to a glass sarcophagus with the embalmed body of Vladimir Lenin, the legendary Russian revolutionary. Located in Red Square, it opened its door to the public in 1924. Since its opening, the place has attracted around 2.5 million tourists every year. The place is open every day except Mondays, Fridays and holidays, from 10am to 1pm. Videotaping and photography are forbidden inside of the mausoleum, as well as talking, keeping hands in pockets and men wearing hats in order to show respect towards Lenin’s preserved body. For those interested in art, apart from many galleries that Moscow has to offer, a New Tretyakov Gallery is a great choice to enrich a day. New Tretyakov Gallery offers 20th-century Russian art, with the centrepiece of the collection comprising Russian avant-garde works of Chagall, Popova, Kandinsky, Goncharova, Malevich; art of the "underground" and "austere style" can be found, as well as some new art trends. Apart from large-scale retrospectives of great Russian artists, experimental exhibitions of young artists are also shown here. The museum offers creative workshops with theoretical knowledge and practical training. After this exhaustive and mesmerizing tour, tourists look for other attractions to fulfill their time. Moscow is a home to some amazing and fascinating restaurants, posh but simple food cafés, theme parks, cutting-edge theaters (Gogol-Center has English subtitles for many performances), opera houses, bars and clubs, museums and many more. No matter how long you decide to stay in Moscow, it offers so many opportunities and places worth seeing that sometimes require another trip.